The cream was too warm for my taste, and the green wasn’t really me either. Plus, the finish had seen better days. 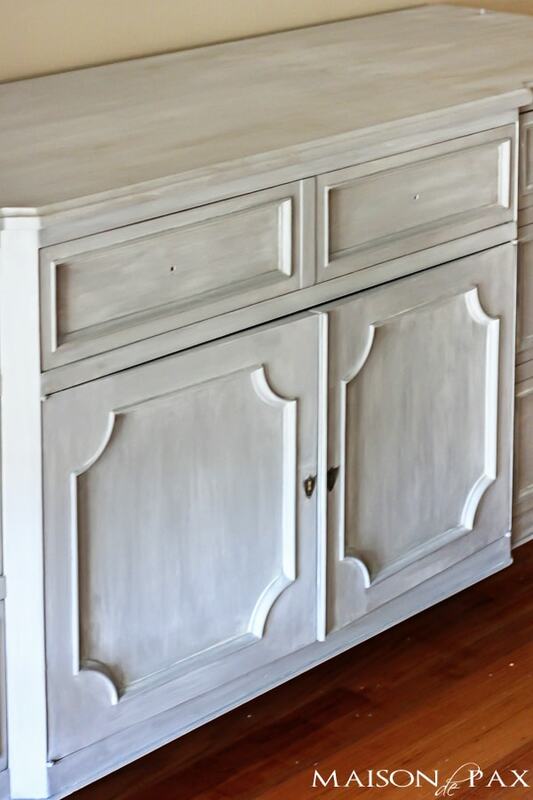 To create this look, I used Chalk Paint® Decorative Paint by Annie Sloan in the colors Paris Grey and Old White, Clear Soft Wax, and Dark Soft Wax. I began with a coat of Paris Grey over the entire thing. 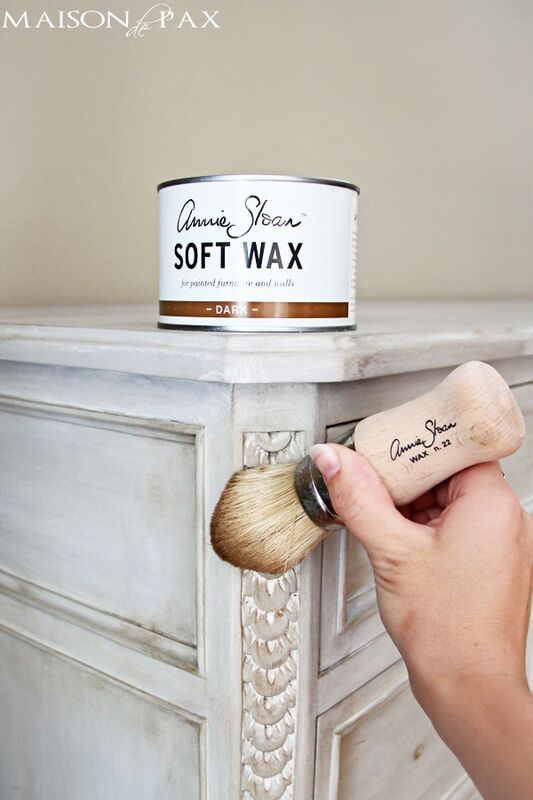 The Annie Sloan Pure Bristle Brush was perfect for getting into the grooves of this piece. I then applied a coat of clear wax over the entire piece. Next, I used the Annie Sloan Flat Brush to “whitewash” Old White over the Paris Grey. To create a wash, I dipped my brush in water first and then in the paint and painted the piece sections at a time. Immediately after painting, I took an old rag and dragged it across the Old White, creating a layered look. Once happy with the look (you can rub it off in places with a wet rag if you get the white paint too heavy), I used the Annie Sloan Wax Brush to apply another coat of clear wax and then to accent the carvings with dark wax. I also used dark wax along the edges and in the corners to give dimension to the door and drawer fronts. I did not apply the Old White to the inside of the cabinet; I wanted a simpler backdrop for my dishes. Although the piece didn’t end up with a smooth factory finish, it’s ok because I wanted an aged, layered, textured look. And since I’m obsessed with gray (you can seem more of my gray projects here if you’re interested), this was the perfect makeover for me. And I look forward to using it for years to come. So what do you think? Did I ruin my family heirloom or manage to bring it gracefully into the 21st century? Rachel how lovely, the color is perfect. Oh my…. it’s BEAUTIFUL!!! I’m envious. Have a vanity I want to paint and am hesitating. Can’t figure out the right paint color to use. But you did a fantastic job!! Thank you so much, Mary! I debated about colors on this thing for YEARS… I know how hard that is. But I’m so glad I did it, and I hope you enjoy yours when the time comes, too! Rachel, what a difference! you did a wonderful job, it looks incredible. WOW! what a beautiful job Rachel. you are so talented. i am thinking about painting a small table i have had for a couple of years now. you have inspired me! keep up the awesome posts, i enjoy all of your projects. 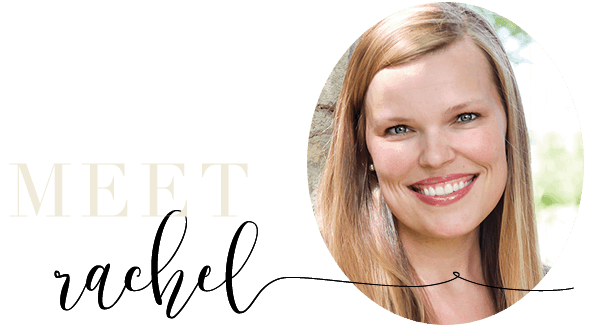 Just beautiful Rachel…great piece to work with and you transformed it to such a exquisite piece…one to treasure for many years to come! I love the way it turned out. I think you did a great job and how nice to have a piece that will always be a reminder of your grandmother. I love pieces with history and memories. Thank you so much! Another Annie Sloan knock-out! I love the color and finish you chose. Paris Grey is one of my favorites too. It’s absolutely gorgeous, Rachel! LOOKS GREAT!! I Love it! What a fabulous paint job! I know you struggled with wanting to paint this piece & love seeing the finished product. It’s SO you. LOVE the depth you gave the drawers. Personally, I think your grandmother would be delighted you took something that was hers and instead of getting rid of it, re-made it into something that was yours. Enjoy my friend. WELL DONE. Thank you so much, Shara!! I so appreciate that. Many many hugs, my friend! Family heirloom is definitely not ruined! 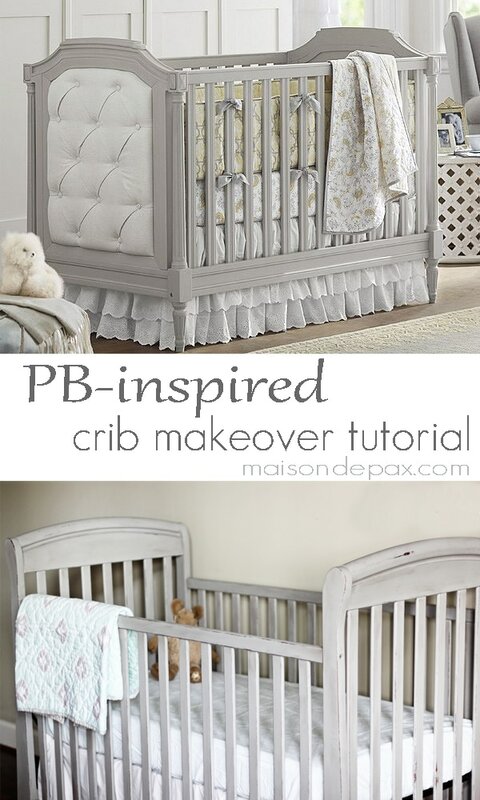 Beautiful transformation–you’ll love it for years and years to come! Hi, I love your piece, it’s beautiful. I am debating what colour to paint my side board, it is a similar size to the bottom part of your unit. The colour old white seems quite cream on the colour chart, but it seems quite white on your piece, is it more white than cream or is it the lighting when you took the photo ? Do you think French Linen would be good under the old white as well, I wanted a white look , but slightly beige . Thank you so much, Jane! I think it may be a combination of the two things: against my greige walls and very ivory/cream trim, the Old White probably looks cooler than it would against a white background on a color chart. However, the Paris Gray is a very cool (almost blue) gray, so the two balanced out to a more neutral color. I actually debated about using French Linen as the bottom coat, and I’m sure it would be lovely. It will come out even darker and warmer, though, than the Paris Gray did. That might make the Old White seem even more cream? I’m just guessing here, but I hope this helps! Love the trunk. Now I have to figure out what color to paint over the one I painted red in a moment of not thinking. Beautiful job!! What color is on your walls, if I may ask? This piece came out lovely! I love the finishes you chose along with the hardware and the dark wax. 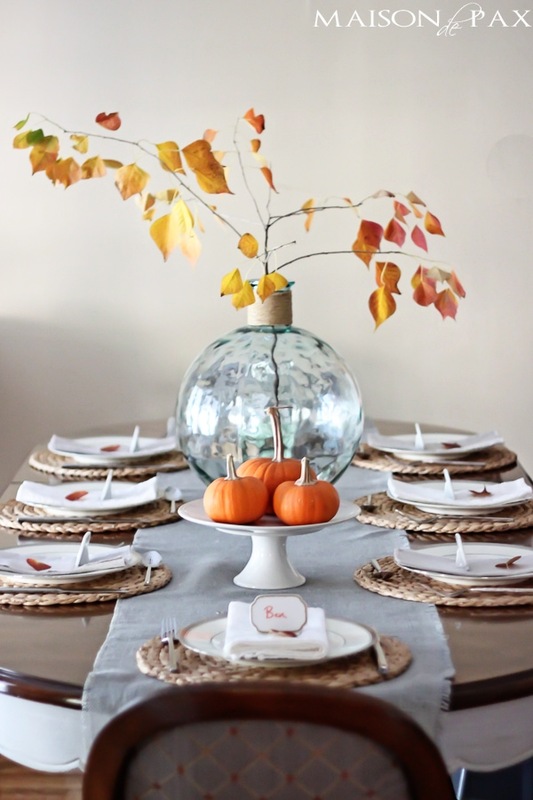 I am so glad I stumbled across this post (and your blog!) Does the clear wax provide a durable finish? Does it need to be reapplied every so often, like furniture oil/polish, or is it a one-time deal? Also, how does it hold up to cleaning? Would you suggest using the wax on pieces that won’t get a lot of wiping (tables, kitchen cabinets, etc.)? Thanks in advance for your expert tips! Thank you so much, Lindsey! Wax finishes are not a one time deal, but they are much more durable than furniture polish. I like to think of them as semi-permanent. While they are not as durable as a varnish or polyurethane, they do not have to be completely stripped and replaced to be repaired. If one area wears faster than another, you can simply add more wax there. 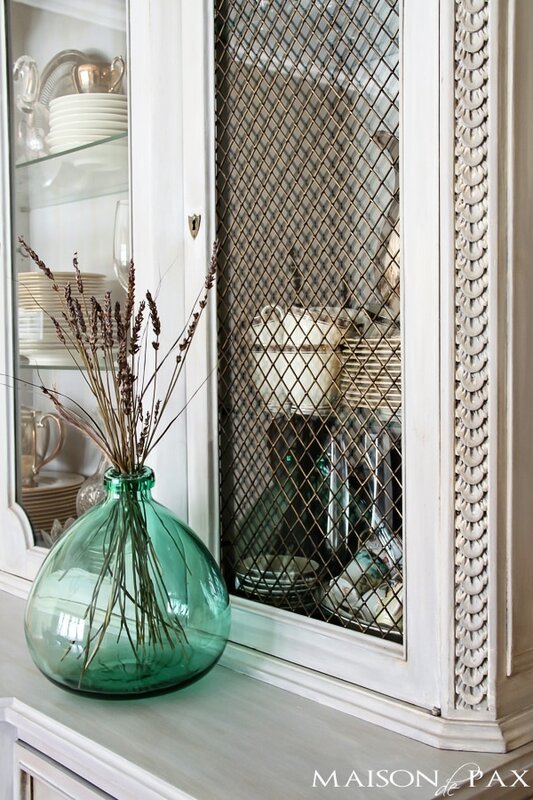 For pieces that get lots of handling (like a table top), you would need to apply more often (perhaps once a year or so), but for something like a china cabinet, it’s just a matter of maintenance. I hope I won’t have to rewax it for many years. And it’s important to recognize that not all wax brands are created equal. Most have their pros and cons, so you may want to look into any specific type before using it. A major factor to remember is that while the wax is water resistant, it is not water proof, so you’d be taking a risk with something like a kitchen cabinet. I hope this helps! Love it! After you were done did you go back over with another coat of clear wax??? Thank you! And I confess I don’t remember, but I don’t think so. I don’t usually go over dark wax with clear wax as it can sometimes remove the dark wax. Hope this helps! 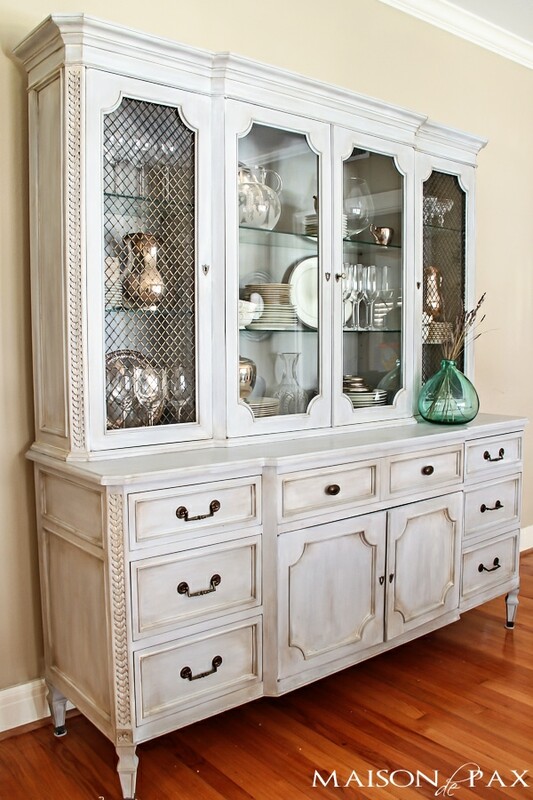 I apologize for commenting on a several year old post, but this cabinet is beautiful! Great job! I love the colors and want to recreate this but I’m afraid it might look too blue-grey in my house. Maybe the old white will warm it up. 🙂 My only question is this… you said you whitewashed after applying the clear wax: did you not not have any issues with the paint absorbing/drying on top of the wax? I’m just a bit confused by that. Thanks! Thank you, Tiffany! I’m so glad you like it. The old white definitely warms it up, and you can always come back with some dark wax at the end to warm it up even more, if needed. I also love French Linen for a warmer (and a bit darker) gray. 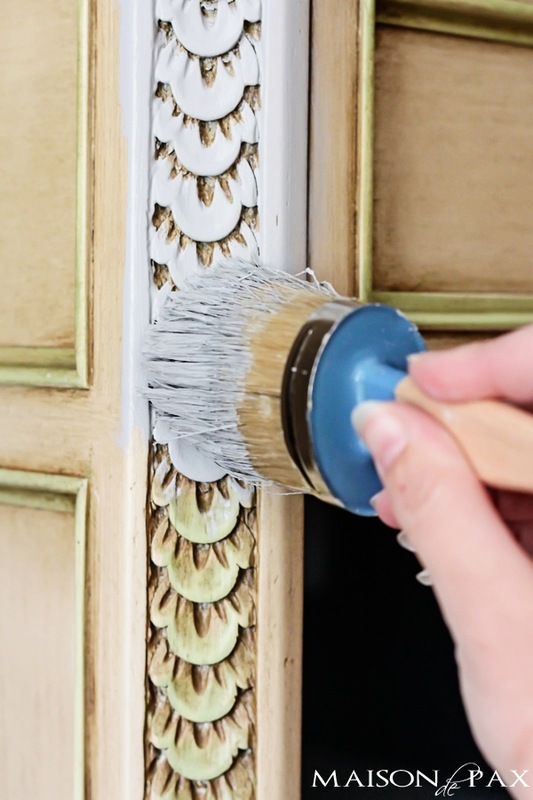 It wouldn’t be ideal for a full piece to use chalk paint over the wax because I would be worried about adherence, but when doing an accent like a whitewash, the incredible adherence of chalk paint works just fine. I haven’t had any problems with it. I hope this helps! Ok this is the most beautiful thing I have come across in a very long time, I’m in love!!! I realize this is a family heirloom, but do you happen to know the manufacturer. I would love to find a similar piece and I just can’t get this set out of my mind. I’m so pleased I stumbled across your blog – AMAZING!!! You are so sweet! I apologize for the slow reply… Unfortunately, I cannot find the manufacturer’s information. I do hope you’re able to find something you love, though! Hi! I love your piece and I’m using the same colors on my bathroom vanity. How long did you wait in between coats and waxing. Must I do clear wax before the white wash? Thanks for your help. I’m so glad you like it! The clear wax before the whitewash gives you more freedom to adjust the whitewash. If you paint the white directly over the gray, it will soak in right away and be tougher to distinguish between the two colors. But it could turn out beautiful either way! And I’m sorry, I don’t remember how long I waited in between coats. I’m guessing I did one coat per day (just because that’s usually all I can manage while my kids are occupied ;). Hi! I LOVE the way this turned out! I have almost the identical piece which was my grandmother’s! 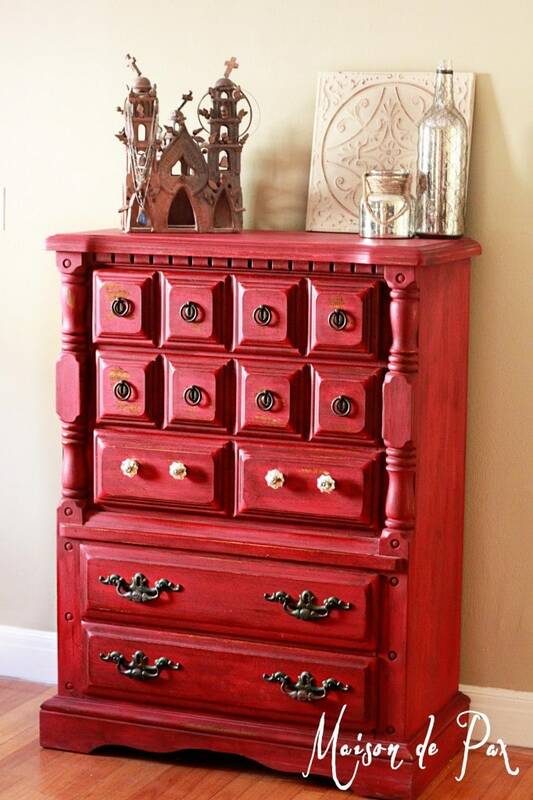 It is still stained in the original wood finish and this is the exact look I’ve been describing to my hubby! 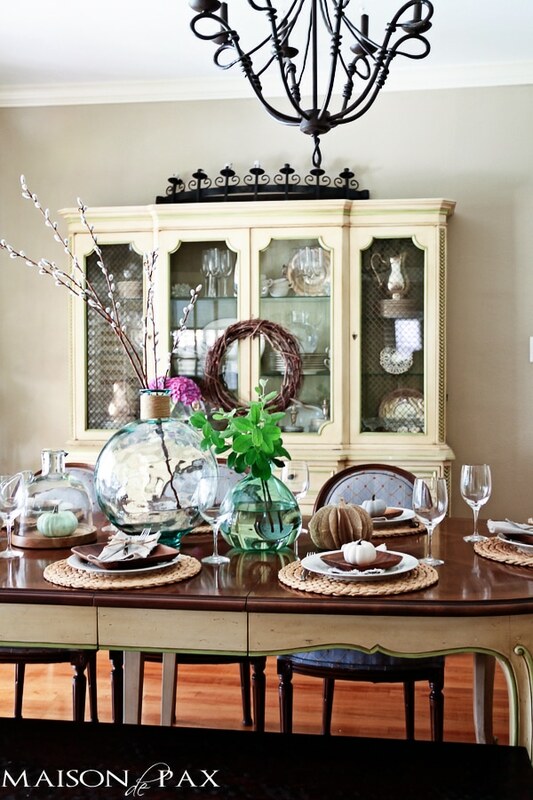 My dining room table looks very much like yours as well and the look you created helps to visualize mine too! It’s going to be a freezing cold New Year’s weekend here (Dallas)…perfect opportunity to get it done! Happy New Year! Oh Ashley, I’m thrilled to hear it! I hope you love it after you’re done. Stay warm this weekend! I absolutely love your finished dining set. You have definitely brought the furniture into the 21st century. . I have an almost identical cabinet but with a larger base. With a bit of remodeling, my kitchen and dining room are now one large room. 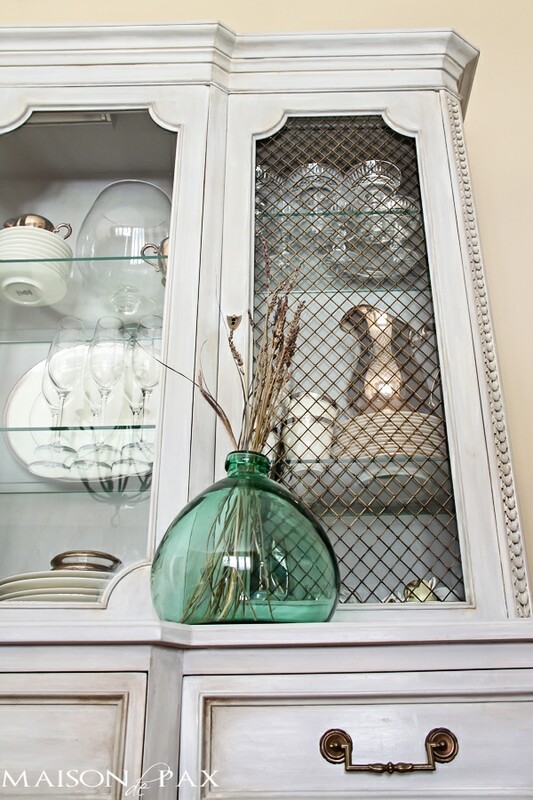 Because my kitchen cabinets are mocha and my island is off white, I have been thinking of updating the color of the cabinet, as well as the island and after seeing your beautiful transformation and the colors used, I am going to copy this exactly. 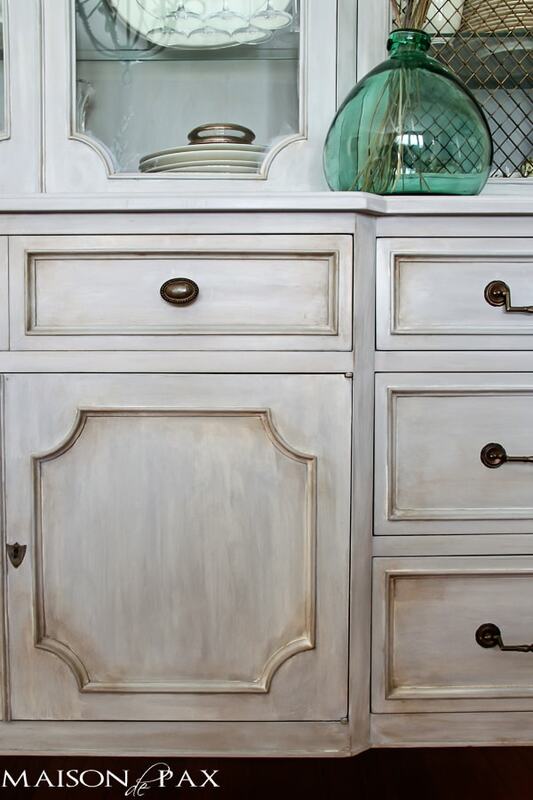 I’ve worked with Annie Sloan paints in the past and love the quality. Thank you so much for the inspiration. Lisa, that all sounds fabulous! I hope the painting goes well and thank you so much for sharing! 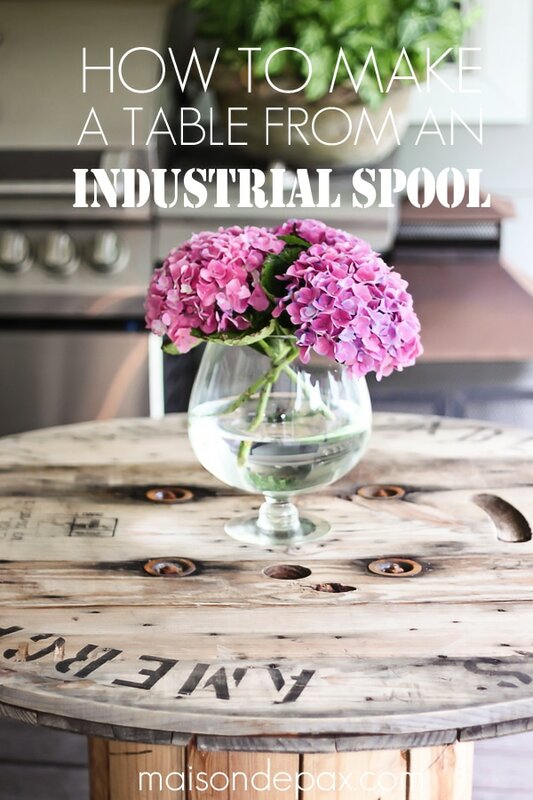 Been eyeing my dinning room set to use Annie Sloan grey on. Tried it on one old chair – didn’t like the outcome. Love what you did with the grey and the white. Going to try it. Ques: what did you use to the table top? Did you just leave as it was? Thank you!! The top was already finished as such, so I just left it alone. I hope this helps and good luck with your project! Oh my goodness, after looking online for color ideas, I also love how your piece finished. 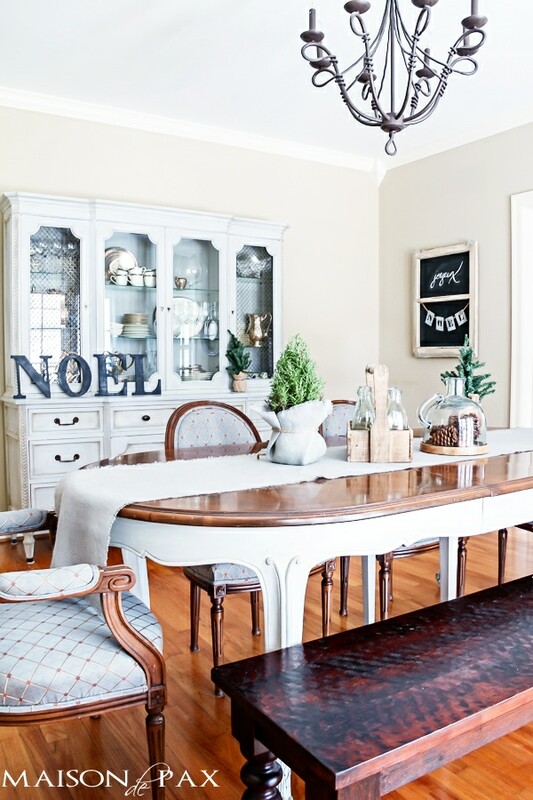 I have not worked with chalk paint before but everyone says how easy it will be. Your instructions are easy to understand and I really think I can do this. My husband is on board to paint our china cabinet too. Wish me luck! I’m sure you’ll do great, Valerie! Good luck! So beautiful! What size flat brush and pure bristle brush did you use? Thank you, Ami! I’m afraid I don’t remember… I think the flat brush was a 2″ (that’s usually what I use), and the pure bristle brush was very large. I hope this helps and I’m sorry I don’t have more specifics! I am a newbe to your website/facebook and I just love your style. 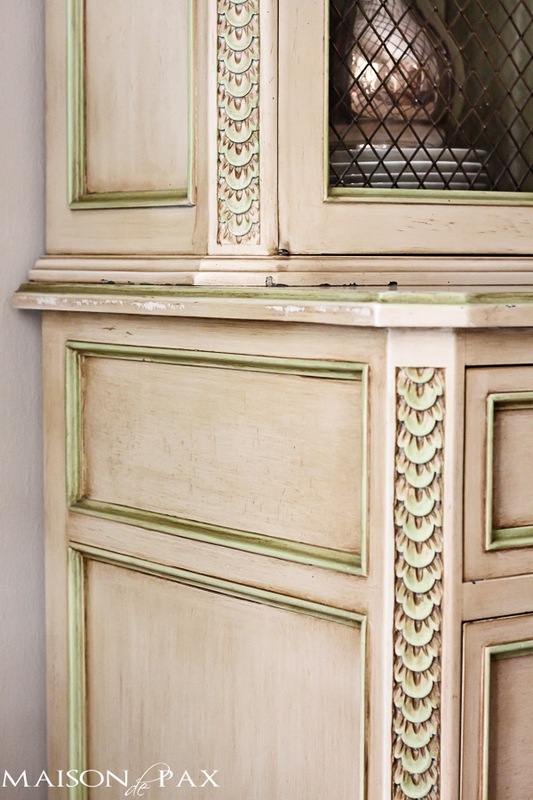 I have been researching how to refinishing my stained dining room hutch which I must say looks almost identical to yours. My husband and I bought it in 1974, I want to have it painted white. Do you think that the Old World White in the Anne Sloan would give a white look. I definitely have warm tones in my home. Also, do you think that the chalk paint has held up pretty well? Thanks so much for your time and expertise. Hi Cheryl! 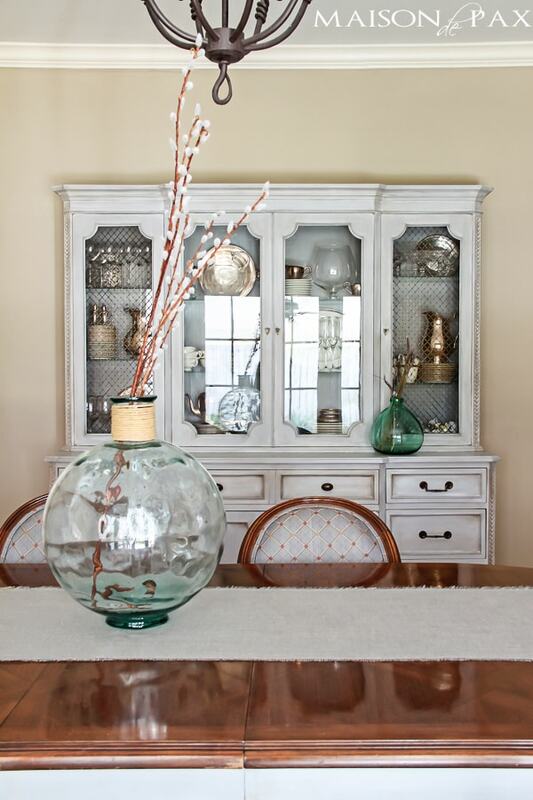 Old white is perfect– it is a warm white and sounds like it would go well in your home. Wax is applied after the chalk paint and I do think it is durable! 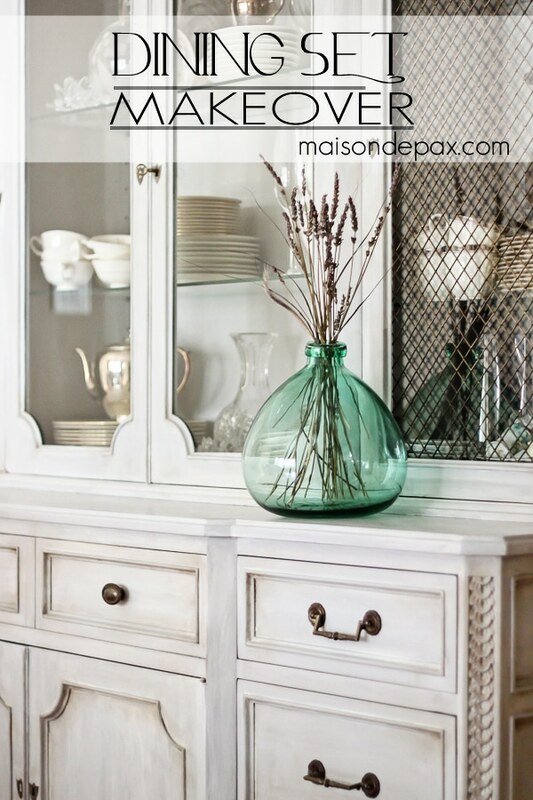 I like to keep a small jar of the chalk paint available to touch up a few times a year. Hi Rachel, I have some nightstands that I want to finish similar to what you did. I noticed that the doors of your hutch have small locks on them, were you able to take those off? Or how did you paint around them? I have something similar on my nightstands and I’m concerned they’re going to get paint on them or be hard to paint around. Also, my nightstands are mahogany veneer, have you ever painted over that? I’ve heard the paint can come out pink. Any recommendations? Thanks for your help, and great job! Hi Melissa, I’m so glad you like the tutorial! I just painted around the locks with a tiny brush, and one of the great things about chalk paint is that it is pretty easy to scratch off if you do so before it fully cures. Any mistakes were easy to correct. 😉 And unfortunately, I have not painted any mahogany pieces, but I hear you can try a sealer (primer or shelac) beforehand to keep the pink from seeping out. You could also just try a test spot on the back and give it a few weeks to see if the pink comes through. I would think that it wouldn’t be as big of a concern with this gray finish as it would be with a white paint job. I hope this helps! I really love the dining room set and am going to try it with mine, my set isn’t as nice but I think this look will really improve it a lot!! I will take before and after pics. I’m practicing on a coffee table first, the drying time of the wax after the gray I’m curious about, how long until you painted the white after waxing? 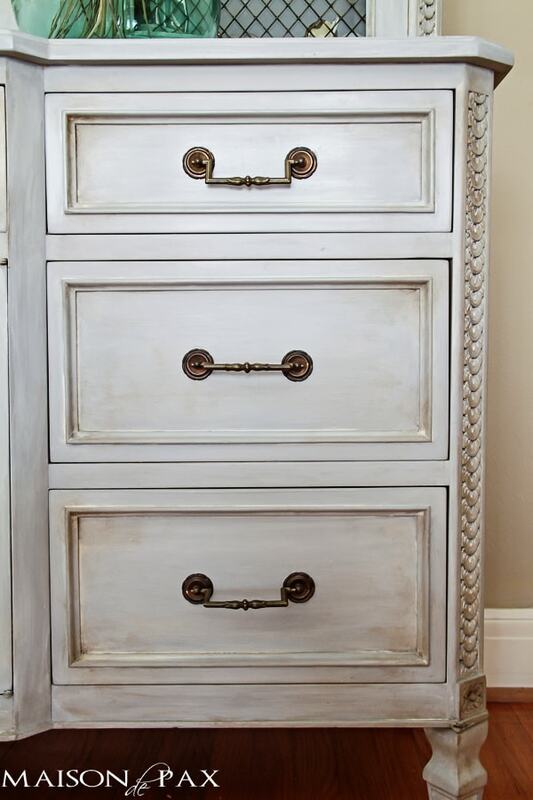 Chalk paint dries quickly, but I’d wait at least 24 hours to make sure it’s completely dry! I love this cabinet from your grandmother. You did a fabulous job. Thanks. Beautiful! What did you use for the chicken wire (probably not the right term)? It looks like an upgraded version of what I’ve seen in other makeovers. Thank you!